Published in 2017 by Sol Vita, 2017, 240 pages, approximately 430 photos, language Latvian (but see review below), size 215 mm × 305 mm, weight 1112 gm, ISBN 978-9984-894-72-0, price €16.50 plus VAT (which when this review was written appeared to be 12%). 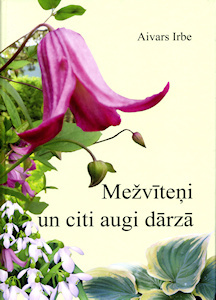 This is an update to Aivars’s previous book ‘Clematis in the Garden’ which I reviewed in 2005. As with his previous book, it is in Latvian, which I do not understand, but there is a one page summary in English explaining the concepts behind the book. As the summary says: ‘This book is updated with new observations, information and experience from the gardens of Latvia and around the world.’ However, the new book is a completely different format from the previous book. The majority of the book appears to be in the form of a diary written over a year from March 2015 to March 2016. There are comments and pictures of what is blooming in Aivars’s garden on a particular day. Some are clematis but there are many other plants featured. For example, on 23rd May 2015 there were clematis atragenes in flower and on 5th June, peonies, phlox and irises. In the diary there is information about shows and events that Aivars has attended in Latvia and pictures and descriptions of a number of clematis books including The International Clematis Register and Checklist 2002 and a number of its supplements. There is advice and/or suggestions on growing clematis as some late flowering clematis feature early in the year with pictures on how they will be in bloom later on in the year. After the diary there is detailed information on clematis subjects, for example on seeds, on growing clematis in the garden and in pots. One photo that caught my eye was of several clematis montana growing in pots, presumably so Aivars can bring them indoors for the winter. There is a section on using clematis as cut flowers and clematis memorabilia. The different groups of clematis (atragenes, integrifolia, viticella etc.) are introduced and then covered in detail with a number of photographs. The book contains a table listing 230 clematis with the breeder, group, pruning group, height, blooming period and details about the flowers themselves such as shape, colour and size. Aivars also lists his top 25 large flowered clematis and top 25 small flowered clematis. Finally, there is a clematis index listing where the varieties are mentioned, where there are photographs and an ‘other plant’ index. There are over 400 photographs in the hardback book and the majority of them are in focus and, I think, an accurate colour. Unfortunately there are a few photos, mainly of small flowered clematis, where the camera appears to have focused on the garden behind the clematis rather than the clematis itself. Some pictures are a full page and others are fitted three across a page to show different varieties. The photos show the wide range of clematis and other plants which Aivars grows in his garden. Overall it is an interesting book despite my lack of knowledge of Latvian.